Actually, I got it for free because I used Extra Reward Bucks from last week – but who is COUNTING!? 🙂 You have one more day to take advantage of this sale. I didn’t write about the nail polish earlier because I wanted to test it out a bit to see if it works – and it does. I’ve been using a nail polish that is very well know and costs about $8 a bottle. 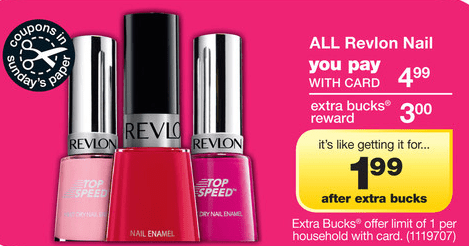 I saw in the CVS circular that they were offering $3 ERB on Revlon nail polish AND I had a $1 off coupon from last weekend’s newspaper. You are keeping those, right? RIGHT? So, I went and bought the nail polish in berry (using no $$) and tried it out. This is the fourth day that the polish has been on my nails and it’s just starting to chip. It’s really slight too – not completely noticeable. End result – today and tomorrow are all that’s left to take advantage of the sale. Try it out and see for yourself. Don’t you just love extreme couponing?! I had a totally different experience with this nail polish. Put it on in the evening and by the next morning it was coming off in hunks. I mean all I was doing was sleeping! By the end of 1 full day half the nail polish had come off in large chips. Maybe I got a bad bottle? Don’t know but as far as I’m concerned this is the worst nail polish I’ve ever tried.